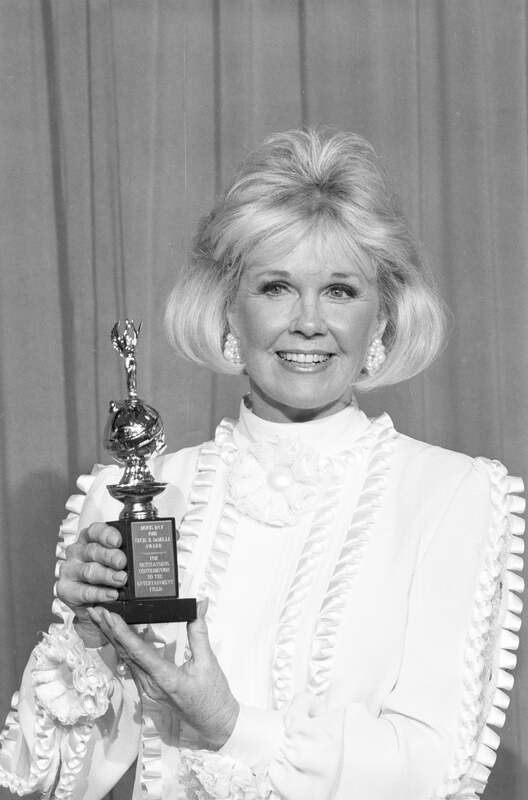 Doris Day in 1989, with her Cecil B. deMille award. It’s been 30 years since the Hollywood Foreign Press Association honored Doris Day with the Cecil B. deMille Award for lifetime achievement. And what a spectacular career she has had. Now as she nears her centenary we can look back on an amazing woman. She celebrated her 97th birthday last week - as she always does, far from the Hollywood she once dominated. Born Doris Kappelhoff she began her career as a big band singer. Her recording of “Sentimental Journey” in 1945 encouraged her to embark on a solo career and landed her a recording contract with Columbia records that that lasted 30 years. Famed director Michael Curtiz recognized her screen potential and signed her to a seven-year contract which was ultimately absorbed by Warner Bros. Her first movie Romance on the High Seas which featured the standard “It's Magic” immediately established her as a star. She made dozens of movies for Warner Bros. including a string of homespun nostalgic classics that bear repeat viewing. She was irrepressible and irresistible in On Moonlight Bay, By the Light of the Silvery Moon and Tea for Two in which she played opposite Gordon MacRae. Her 1951 musical I’ll See you in My Dreams, the life story of Gus Kahn (played by Danny Thomas), was her most successful Warner Bros collaboration benefitting from working again with Michael Curtiz. 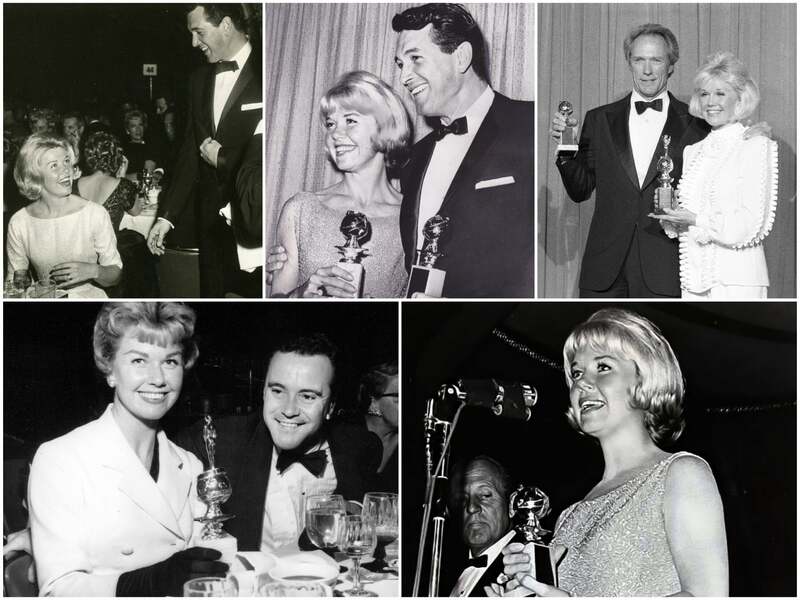 Doris & the Golden Globes: (from top left) in 1960 meeting Rock Hudson at the Golden Globes gala; in 1963, pairing with Hudson with matching World Favorite awards; in 1989 with her deMille award and Best Director Clint Eastwood; (from bottom left) in 1958, with Jack Lemmon and the World Favorite award; in 1963, on stage. She followed that with another memorable role in Calamity Jane but chose not to renew her contract on the advice of her husband and agent Marty Melcher. And thus began the start of a new career as an iconic superstar five times voted World Film Favorite by the HFPA. But then Doris never got much love from anyone other than the Hollywood Foreign Press Association. She was nominated six times for a Golden Globe. Following that performance, Doris began successful collaborations with producer Ross Hunter and famed director Alfred Hitchcock. With Hitchcock, she made his remake of The Man Who Knew Too Much, and with Ross Hunter she made Pillow Talk which began her successful pairing with Rock Hudson with whom she maintained a close friendship, publicly supporting him when he was diagnosed with AIDS. With Hudson she also made Lover Come Back and her best romantic comedy, Send Me No Flowers. A sad chapter in her life was her discovery, after his death, that Melcher had squandered her earnings leaving her in debt. But she persevered and eventually prevailed. Among her other achievements she can point to her loyal support of a ravaged Rock Hudson in his final days and her lifelong devotion to animals.